Hay fever and Asthma attacks can be brought on by Scented Plants as well as pollen or Fungal Spores. Histamin problems can also be exacerbated by scent and smells in the garden. Ferns reproduce by sending out millions of spores from under the leaves. If you suffer then do not grow any ferns. Fungus and mould are common names for a large variety of mycelium like Alternaria that grow on dead and rotting plants. They reproduce by light invisible spores that are distributed in the air usually in late Summer and Autumn. Compost heaps are home to fungus and ideally should be avoided if you are allergic but a closed system rather than an open pile will be better. Spent mushroom compost can be an allergy disaster – don’t use it. Organic compost and mulch may be a problem but coconut shell is probably one of the lower spore hosts. Compost in a closed container. Scented Plants are generally pollinated by insects feeding on the nectar. This can include wasps and bees so if you are allergic to stings avoid such plants. Some people are sensitive to a range of smells and perfumes or just the scent of one plants such as a lily or honeysuckle and in this case choosing plants for a garden can be an issue. Aromatic leaved plants like many herbs only give off a scent when brushed or crushed so it may be worth growing herbs but take care with Lavender. If you are allergic to Daisies you will also potentially be allergic to Asters, Chrysanthemeum and other members of the same ‘compositae’ family. 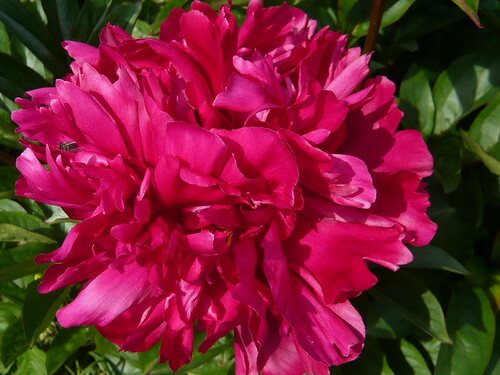 Many double flowered varieties attract pollination by colour and have less scent. Fruit attract wasps so if allergic to stings don’t grow them or have another member of the family grow them well away from windows into the house. Some allergies are related to individual plants like Strawberries and Tomato so watch for individual reactions and root out offenders. Deciduous trees have more pollen than evergreens. 1. Choose plants that are pollinated by bees, the pollen is heavier and sticky and therefore stays on the bees rather than floating around the garden. 2. Avoid wind pollinated plants which disperse copious amounts of pollen into the air. 3. Avoid plants which are intensely fragrant as they can be a trigger for allergies and asthma. 4. Choose female plants, as they produce no pollen. Sterile male plants are also a good choice. 5. Grass is a major pollen producer so mow your lawn regularly, before it flowers. 6. Wear a mask when mowing lawn or trimming hedge. 9. Avoid ornamental grasses in your planting schemes. 10. Remove hedges which harbour dust, pollen grains and mould spores which can trigger asthma and allergy symptoms.